Are people safer if criminals know who is carrying concealed handguns? Arkansas Attorney General Dustin McDaniel seems to think so. With school starting soon, he claims that if the Clarksville, Arkansas School District lets employees carry concealed handguns at school,their names must be made public. This is his second attempt to derail the school district’s proposal. McDaniel’s demand to publicize the names will greatly limit the protection these employees can offer. School shooters have a strategic advantage in that they determine when and where to attack. The alternative of hiring uniformed armed guards is not only costly, with one armed guard costing more than the cost of training and equipping over 20 employees, but also relatively ineffective as they are usually the first victims shot (e.g., see . . . .
A copy of the PR manual for Bloomberg AKA Mayors Against Illegal Guns is available here. 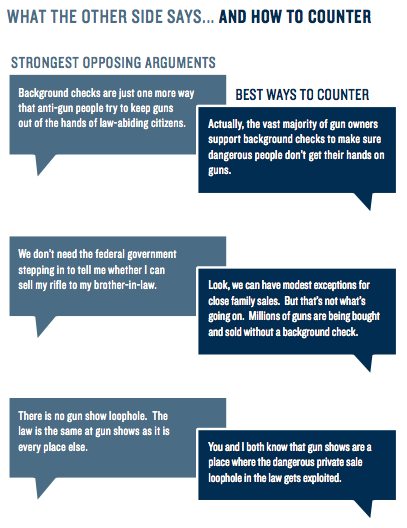 In this post, I am just discussing five of their comments regarding background checks. Here are my responses to their counter arguments. 1) Do the polls really show that the vast majority of Americans or gun owners really support expanded background checks? My response is available here. 2, 3, and 4) Are millions of guns being bought without background checks? Are gun shows a likely source of guns for criminals? Are terrorists really using gun shows to obtain weapons? About 0.7 percent of guns owned by criminals are obtained at gun shows. Of course, the original claim that there is no "loophole" in the sense the term is used is correct and you might note that the PR response ignores this. The real issue though is whether back ground checks in general are working. Here is one of my many discussions on the issue available here. The ultimate issue is whether gun show regulations reduce crime rates and if you see Chapter 8 in my book The Bias Against Guns. Chapter 10 in the recent third edition of More Guns, Less Crime has a much briefer and less complete discussion, but it has more up-to-date data. 5) This 30 percent is meaningless. It is 30 percent of the high risk cases that the ATF investigated. It is not a random sample. For example, if the ATF was really good at picking what cases to go after, the percentage would be 100 percent. Miami Beach police say an 18-year-old died after being shocked with a stun gun as he resisted arrest for spraying graffiti.Chief Ray Martinez told the Miami Herald that officers spotted Israel Hernandez-Llach painting graffiti on an abandoned fast-food restaurant early Tuesday. Martinez said the teen ran, but was eventually cornered. He said Hernandez-Llach then ran at the officers and one shot him with a Taser in the chest. The teen went into medical duress and died at a hospital. . . .
A 29-year-old man at a special needs facility on Long Island died after police shot him with a stun gun when he fought them as they tried to take him to the hospital for a psychiatric evaluation, authorities said. Staff at the Maryhaven Center of Hope in Middle Island called police Wednesday night to report Dainell Simmons, a resident at the facility, had become violent and uncontrollable, officials said. . . .
Wilmington police are investigating the death of a 28-year-old city man Sunday night after he was hit with a stun gun multiple times following a police pursuit. Police began pursuing a vehicle at 8:09 p.m. at 25th and Madison streets when officers attempted to stop it, department spokesman Cpl. Mark Ivey said. He said a high-speed chase ensued but was called off because of “public safety concern.” . . . There have been warnings from the manufacturer not to target people's chest near their heart. Through a Freedom of Information (FOI) request, the Guardian newspaper was able to obtain statistics on the use of the electroshock weapon dating back to 2009, from 18 of UK’s 45 police authorities. The data revealed that out of 906 total charges unleashed, 518 were aimed at the chest. This constitutes 57 per cent of total uses. It also directly contradicts advice given by the electroshock weapon’s manufacturer. "When possible, avoid targeting the frontal chest area near the heart to reduce the risk of potential serious injury or death,” says the Taser International training manual. "Serious complications could also arise in those with impaired heart function or in those with an implanted cardiac pacemaker or defibrillator." . . .
Another recent case from the UK. On July 10, Jordan Begley, a 23-year-old factory worker, died after being hit with a Taser gun fired by police at his home in Gorton, a district of Manchester, England.Reports said that he died shortly after a 50,000 volt charge Taser gun was fired at him inside his home at 8 p.m. . . .
Americans are evenly divided on whether the United States needs tougher gun control laws, but most still agree that existing laws need to be more strictly enforced. Forty-six percent (46%) of U.S. Adults believe the United States needs stricter gun control laws, according to a new Rasmussen Reports national telephone survey. But just as many (46%) say the country does not need stricter gun laws. (To see survey question wording, click here.) . . . Newly uncovered Democratic anti-NRA talking points urge anti-gun advocates and politicians to hype high-profile gun incidents like the Florida slaying of Trayvon Martin to win support for new gun control laws. In talking points likely followed by top Democratic leaders including President Obama after the Sandy Hook Elementary School shootings in December, the anti-gun "guide" urged gun foes to speak out when a shooting "creates a unique climate" to shout down the National Rifle Association. 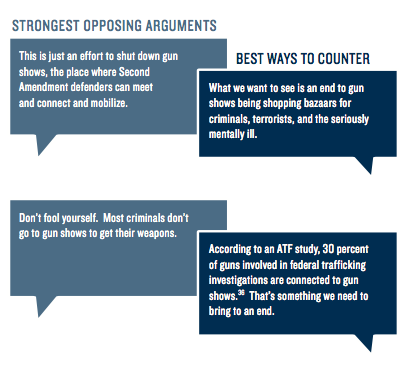 "The most powerful time to communicate is when concern and emotions are running at their peak," said the 80-page document titled "Preventing Gun Violence Through Effective Messaging," and produced by three Democratic firms led by the polling and research outfit Greenberg Quinlan Rosner Research. . . . It is chilling how they want to use tragedies when the emotions are most raw to push their gun control program. "The debate over gun violence in America is periodically punctuated by high-profile gun violence incidents including Columbine, Virginia Tech, Tucson, the Trayvon Martin killing, Aurora, and Oak Creek. When an incident such as these attracts sustained media attention, it creates a unique climate for our communications efforts," said the guide. "A high-profile gun violence incident temporarily draws more people into the conversation about gun violence," added the talking points. "We should rely on emotionally powerful language, feelings and images to bring home the terrible impact of gun violence," said the guide, which also urged advocates use images of scary looking guns and shooting scenes to make their point. . . .
A 20-year-old attempting to rob a Waffle House pointed his gun at the wrong people early Monday, police say. A police officer and a security guard, both off-duty, helped thwart the would-be criminal. Wearing a black bandanna over his face and a hoodie, Ashton Macafee walked into the south Fulton County diner in the 4300 block of Jonesboro Road shortly before 2 a.m. brandishing a handgun and demanding money, said Detective Gloria Hodgson with Union City police. “Nobody move and open the cash register,” Macafee allegedly said. After his demand, Macafee pointed a gun at a man seated at a booth, according to police. That man, off-duty Atlanta police Officer Jonathan Sutton, couldn’t reach for his service weapon. But the man seated next to Sutton, an off-duty security guard, fired two shots, police said. The security guard, identified as Evans Chad Pollard, shot Macafee. “I felt that not only my life, but everyone’s life was in danger, so I had to do what I had to do,” Pollard said Monday afternoon. . . .
One person has died after being struck by a vehicle in a Venice hit-and-run that left 11 other pedestrians injured, authorities said. The incident occurred about 6 p.m. near the intersection of Dudley Avenue and Ocean Front Walk, according to the Los Angeles Fire Department. Initial reports indicated that two of the victims were critically injured and two others were in serious condition. One of the victims died at a hospital Saturday evening, according to Lt. Andrew Neiman of the Los Angeles Police Department. A man was detained in Santa Monica Saturday evening in connection with the incident, Neiman said. Witnesses said the driver of the dark-colored sedan was “moving purposefully” at about 20 mph when the vehicle struck several pedestrians and tables near the boardwalk, according to LAFD spokesman Brian Humphrey. . . .